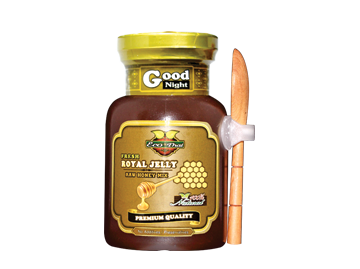 - Royal Jelly is rare food produced in minute amount by worker bees for the sole nourishment of Queen Bee. - The Queen bees' life span is 6 to 8 years, while drone bees' is 6 weeks. Royal Jelly is the food for Queen Bee while drone bees diet is honey and bee pollens. - High in nourishment, rich in natural minerals, good source of dietary fiber and absorb easily by body. - Therefore, Queen’s remarkable levels of energy, longevity and reproduction capability are due to her diet of Royal Jelly. - Rich in anti-oxidants properties, proteins, amino acids, lipids, natural hormones, minerals, folic acid, fatty acids and vitamins e.g. A, B compound D and C. The taste of royal jelly is sour due to natural fermentation with little spicy. ** Wooden honey dipper, spoon and container are coated with BEES WAX, suitable for food usage. حليب النحل النقي بنكهة التوابل والحامض خلطة بالعسل لا يمر بعملية التسخين وهي سهلة التناول مع القيمة الغذائية تماما من حليب النحل. حليب النحل هو منشط قوي سوف يشعر المستهلكون بالنشاط والحيوية من المواد الغذائية التي يحصل: البروتين، 7 أنواع من الأحماض الأمينية، الفيتامينات، المعادن. تناوله من أجل إعادة تأهيل الجسم من التعب، تنشيط الدورة الدموية في الجسم. حليب النحل هو أفضل هرمون طبيعي من دون آثار جانبية لتناوله.